Bali sterling silver figured pendant on a necklace of raspberry quartz (permanently dyed) rondelles with Indian sterling silver spacers. The closure is a sterling silver toggle. Spectacular Nevada Blue Gem graduated disks with brown heishi spacers. The disks increase in size from 3/8 inch to 1 inch in diameter. All findings are sterling silver. 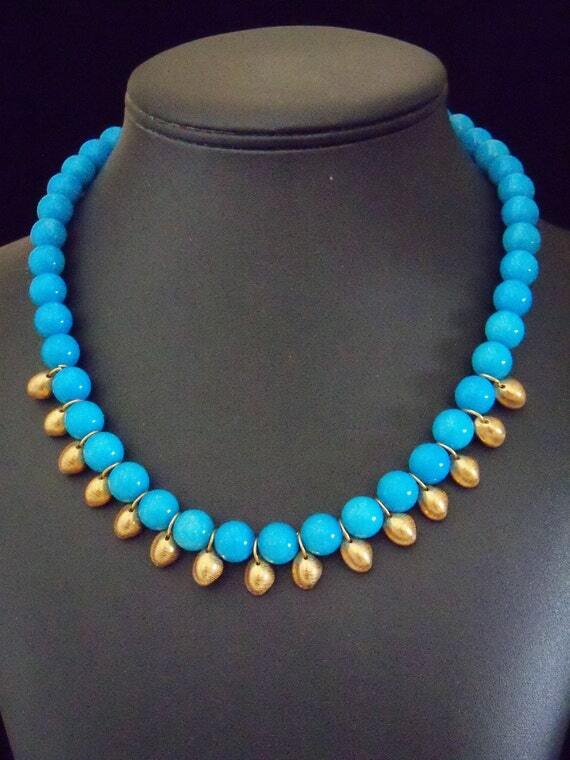 High quality turquoise is becoming very difficult to find. This piece looks equally great with office attire or with jeans and a sweater. The perfect gift! Length is 26 & 1/2 inches with a 5 inch sterling chain extender. Three strands of natural mookite transitioning into flat slices of mookite in the back of the necklace. Length is 19 inches with a 3 inch extender chain. Gold-filled findings and beads. A mookite kerfuffle—just saying it will start the conversation! Wood ovals of 1.875” by .875” separated by 10mm crystals that transition from pale maroon to blue. All findings are sterling. Length is 17&1/2 inches. Please see the bracelet and earring galleries for matching pieces. Reminiscent of the Jetsons era! Necklace of peach aventurine rondelles with asymmetrical carnelian rectangles, trimmed with gold filled spacer beads, gold filled chain, and gold filled lobster claw clasp. Five strands of small garnet nuggets making up a total of 8&1/4 inches of the necklace. Pierced 21mm sterling silver station beads trimmed with 7mm sterling round beads. Back is raspberry colored 12x10mm quartz rondelles, finished with a sterling silver toggle clasp. Add an elegant pop of color to any outfit! 8mm blue quartz beads with 2mm gold-filled spacer beads, accented with 15mm gold vermeil (sterling silver with heavy gold electroplate) corrugated ovals and sapphire blue Swarovski bicones. Gold-filled hammered hook closure. Five-strand rectangular jasper tubes in tones of brown, gold, pink, and red, with charcoal grey glass seed bead spacers. Sterling hook and ring closure. Strung on beading thread for a very soft drape. Golden rutilated quartz 22mm beads with African brass horns. Vermeil lobster clasp. Length is 19″ with a 4&1/2″ brass chain extender. Carved stone dragon pendant, irregularly shaped (approximately 4 inches x 3.25 inches), wrapped in chased and stamped sterling silver and brass, with a faceted 12mm carnelian in the bail. The necklace is 12mm green jasper beads with a pair of 20mm carved trellis beads (probably bone or horn) and 6mm carnelian beads. The hook and chain are sterling silver. Carved howlite Kuan Yin pendant (2 inches by 1&1/4 inches) on 12mm howlite beads with hematite disks. Kuan Yin is the bodhisattva associated with compassion. The name Kuan Yin means “Observing the Cries of the World.” She is known as the Goddess of Mercy. Length is 20 & 1/2 inches with a 3 inch stering silver extension chain. Sponge coral beads (20mm) with large Turkish style brass stations. Gold filled spacer beads, hook, and chain. Bright and exotic, this color combination is great for fall, and certainly makes a statement! Length is 30 inches with a 3 inch extension chain. This very unusual piece is variegated agate in tones of golds shading to a mauvy purple, with vintage brass and amber* stations and a carved stone** pendant. The hook clasp is gold filled. *The vintage bead stations were sold to us many years ago as amber, but because the material is mounted in brass we were unable to test it. **We aren’t sure what stone was used for the carving but it definitely has presence! Length is 23.5 inches with a 3 inch extension. The pendant measures 5.5 inches wide by 2 inches high. Blue agate slices with paler blue chalcedony round beads and pewter daisy spacers. The closure is a large heart shaped sterling silver toggle. This piece will fit nicely inside a tailored collar for office wear, or over a turtleneck for a more casual look. It will also look great with beachwear at your favorite resort (but don’t wear it in the water!). 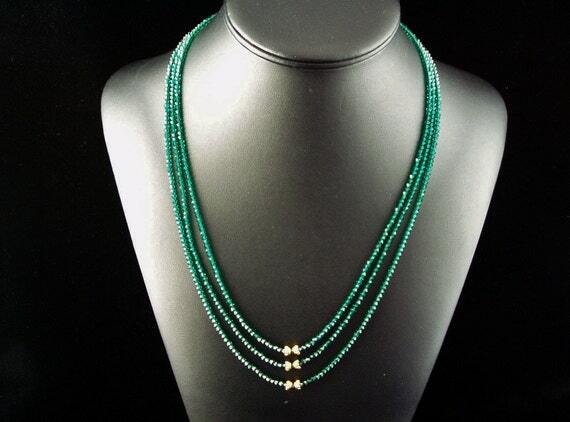 Three strand Swarovski emerald 2mm bicones with gold vermeil center focal beads and clasp. The variation in color that you see is the shine on the crystals. The color is a consistent deep rich emerald green. Perfect with a little black dress for that elegant holiday party. Baroque blister pearls (approximately 1.5″ x .5″) with 6mm to 8mm freshwater pearl spacers and sterling extender and hook. This unique piece evokes tribal sea cultures with its organic shapes and ocean greys. It will make a perfect focal piece with everything from grey cashmere to cotton tees. Length is 16 inches with a 2&1/2 inch sterling extender chain. Necklace of Hubei turquoise nuggets with five large hand cut turquoise rondelles, 8mm matte black onyx beads, and sterling silver spacer beads. The nuggets and rondelles have a hand hewn quality – definitely no machine cut uniformity here! The matrix is very dark, which makes for a dramatic contrast with the vivid turquoise. Necklace of five dyed agate slices (average 2 inches x 3 inches) with 12mm chalcedony and 4mm copper spacer beads. Copper hook closure. Gorgeous earth tones suitable for all seasons. Two strands of dyed yellow quartz slices of various sizes (average 20 x 28 mm) hang like ruffles from asymmetrical moss agate beads (average is 15 x 20 mm) with Turkish style focal beads of brass and Indian silver (50 x 20 mm). The clasp, chain and 4mm beads are all gold-filled. Necklace of dyed purple and black onyx (averaging 1.5 inches x 1 inch), trimmed with 10mm black onyx beads, 4mm sterling spacers and sterling hook. This is a great choice for all you lovers of things purple! Turquoise colored 10mm dolomite beads and 6x8mm gold plated metal cowrie shell dangles, with gold filled hook and extender chain. 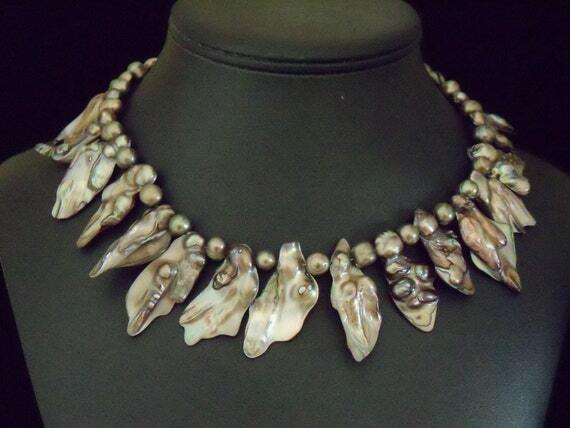 Both elegant and exotic, this is a great piece to wear with business or holiday party attire. It would look pretty great on a black turtleneck with jeans, too! Earrings to match are available in the earrings section of our store. I was especially drawn to item #909! Was it a one of a kind piece ? Lovely pieces…….that was my favorite! Are these pieces only sold on line?